May 1st, 2018. We are pleased and proud to announce the first scholarship for the class of 2018. This is for one of the financial need-based scholarships. We interviewed six candidates and we had so much trouble selecting two that we selected three and split one of the $5,000 annual scholarships in half! For all the information on the KJO Memorial Scholarships offered in 2018 click here. One member of the Amundsen HS class of 2018 has been selected to receive the KJO Memorial Scholarship. A $2500 annual scholarship renewable for four years annually renewable for four years provided the recipient maintains a GPA of 3.0 out of 4.0. A $10,000 value in total! This is the first time a Chicago Public HS student has received a KJO Memorial Scholarship! Kelli Joy was known throughout her brief, beautiful life for living up to her name – spreading “JOY” to others, whether it was saving up to help children in other parts of the world or simply asking a boy sitting alone in the cafeteria to join her lunch table. Our winner today overcame obstacles to maintain a solid GPA, was an active participant in track and gave back to her community through several service projects. She shares Kelli’s love for travel and helping others. Her application describes her dream of someday starting an international nonprofit organization, possibly one to empower women and girls. Her glowing recommendations included examples of her hard work and dedication. But what made her really stand out was the mention of how she quietly looks out for others and how she often included classmates that were left out. 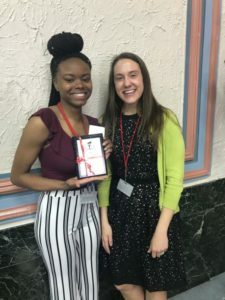 The Kelli Joy O’Laughlin Memorial Foundation Scholarship recipient from Amundsen High School is Myreanna Smith (left). Pictured with Melissa Douglas, Kelli’s sister.